The staf was so kind and helpful. When we needed anything they were dropping it off at the door within minutes. The beds were nice and the views were amazing. Just be aware of the daily parking $$$ if you rent a car oh. I wish staff would check on the Splash Lounge because there were people having multiple alcoholic drinks and their cups end up in the water. Beautiful property and friendly staff. Modern decor and great location. There is umbrella, beach toy and towel available for people who are going to beach. Suit room is spacious. What we did not like was that on Orbitz we were told that the car parking fee for the hotel would be $30 a night. The hotel did not honor that, they said it was $42 per night; $45 with valet parking. The set service fee of $29 per day seems to be padding on the bill. The breakfast we had one morning was not worth the price of $25 each. There was a selection of fruits and cereals but not much else, eggs and meats had been sitting for some time, and thus looked a little suspect. There was free coffee in the lobby each morning, but never a selection for people who do not drink coffee. The coffee offered in the rooms was also not the best - the excuse was that they had to offer only what the company brought in. So only decaf coffee, green tea, hot chocolate and vanilla macadamia coffee were the choices. We called three times for help with the coffee maker, too high in the cupboard for us to operate, and finally it was put into the bathroom. Then the plug did not work and had to to be reset each time the machine was activated. For the price the hotel charges, they could do better in little things. The valet service folks are above and beyond with their helpfulness, highlighting maps for us each day, and always cheerful. Many thanks to them. Staff was extremely friendly and helpful. I really liked the look the hotel and rooms. Location was ideal for someone not concerned with being beachfront and the amenities offered were great. Gorgeous hotel, exciting location! Disappointed by the price of parking but it seems to be the status quo for the area. All of the staff was so friendly. AC is really quiet. I didn't hear any disturbances from Neighbors. They are a green hotel, which I love!! You can get credit back if you forgo cleaning your room. I love that! A nice hotel and reasonably priced but the parking is a bit challenging. Both check in and check out were extremely quick and easy. The staff was very friendly and helpful. I loved my room, it was crisp and clean. Great location, walking distance to everythjng. I would definitely stay there again. Great hotel and location! Would definitely stay there again. Hotel staff are super friendly. This is a nice boutique hotel, but it’s not on the water. It does have a little bit of an ocean view. The location of the hotel is perfect though. It is right in the center of Waikiki and so conveniently located to all the restaurants, shops and beach. The beach is only about a 5 min walk from the hotel. The whole entire hotel staff were sooo nice. We really liked how our room was so spacious and comfortable. Our housekeeping service did an amazing job the whole entire time we were there: I’m really impressed by this hotel and will definitely be back to stay again. My husband and I enjoyed our stay Hyatt Centric Hotel at Waikiki so much. When we arrived cranky, parched and hungry the Valet made our arrival a breeze and directed us to the lobby where we checked in. We were greeted with shell leis and ice cold delicious pineapple juice. Our room was beautiful, air-conditioned and quiet. Our room hostess Lea, made sure we had everything we needed and even brought us extra coffee pods in the flavor we liked the best. The hotel restaurant had delicious meals and the bar had fabulous drinks. We loved our stay. We both felt like every request had a YES (with a smile) answer. 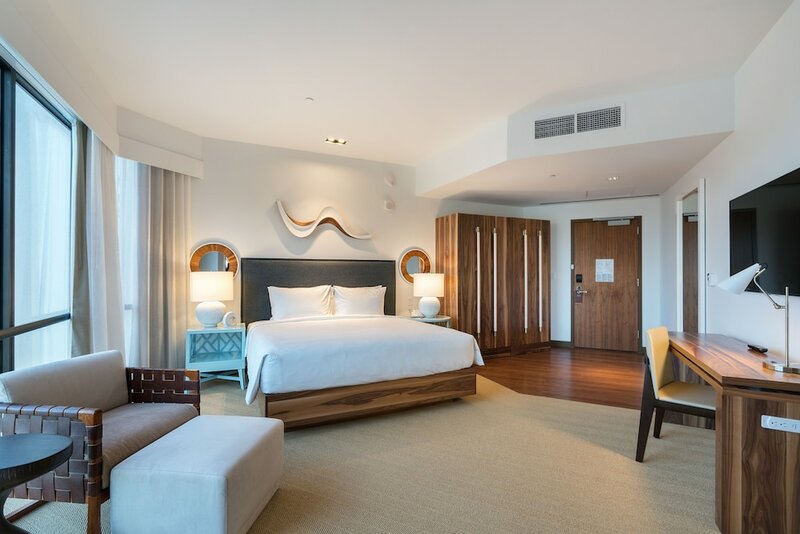 Located in Waikiki, Hyatt Centric Waikiki Beach is within a 5-minute walk of popular attractions such as Royal Hawaiian Center and International Market Place. This 230-room, 4-star hotel has a restaurant, an outdoor pool, and free in-room WiFi. Sit down for a leisurely bite to eat at the onsite restaurant, or enjoy a drink at the bar/lounge. Savor a meal from the comfort of your room with room service. For your convenience, a buffet breakfast is served for a fee each morning from 6 AM to 11 AM. Guests can expect free WiFi and 55-inch an LED TV with pay movies. Beds sport premium bedding and the bathroom offers a hair dryer and designer toiletries. Other standard amenities include a refrigerator, a coffee maker, and free local calls. Guests staying at Hyatt Centric Waikiki Beach enjoy an outdoor pool, a fitness center, and free WiFi in public areas. Valet parking is offered for USD 45 per night. The 24-hour front desk has staff standing by to help with concierge services, luggage storage, and dry cleaning/laundry. Additional amenities include conference space, a business center, and a library. Onsite venue - Restaurant and bar specializing in American cuisine. Open daily. Recreation features at Hyatt Centric Waikiki Beach include an outdoor pool and a fitness center.